From prospectors' haunts in old ghost towns dating back to the Gold Rush, to the now-almost-deserted roadside towns of Route 66, the history of Southern California lives on through its abandoned towns and buildings. Through old settlements and institutions, now left to decay in the high desert or even in the middle of bustling, glamorous Los Angeles, readers can get a glimpse into the waves of migration that shaped the spirit of Southern California. The story of the state seems to repeat throughout different decades: California was perceived as the land of unlimited opportunities and renewed hope for incoming migrants, yet often led to a harsher and more challenging existence in real life. Nevertheless, the dreamers and fortune seekers who moved out West, whether for gold, land, spiritual reasons, health, or to escape the rapidly spiraling East Coast during the Great Depression, always persisted. As they moved from one location to the next to seek their fortune, their ambitions, failures, and lives became encased in the places they left behind. 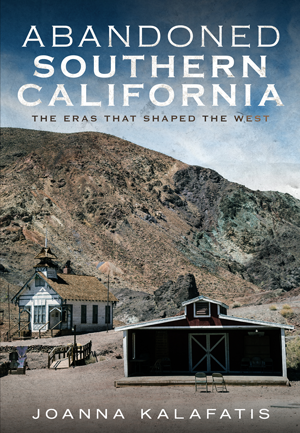 This book is the story of those people and places, and the enduring forces that created California as it is today. JOANNA KALAFATIS is a travel writer and actress based in Los Angeles. She has previously lived in New York and Greece, and traveled to over thirty-five countries. After obtaining her B.A. in Economics from Barnard College, she decided to apply herself to her creative pursuits. Her articles have appeared in several online and print publications, and she also writes on her travel blog, LosetheMap.com. Joanna has a deep love for and fascination with her adopted state, and is always trying to learn as much as possible about the history and experience of California.